Get the Ultimate Computerized Rig for Only $75! GET THE ULTIMATE COMPUTERIZED RADIO FOR ONLY $75! CLICK HERE to learn more about Version 5's new features. Have you been coveting one of those new computer radios? Chances are, you already have the ultimate computerized rig on your bench. Most transceivers support computer control. All you need is good software. Or do you already have the most high tech radio in the world and now want to interface it with your computer and your smartphone? 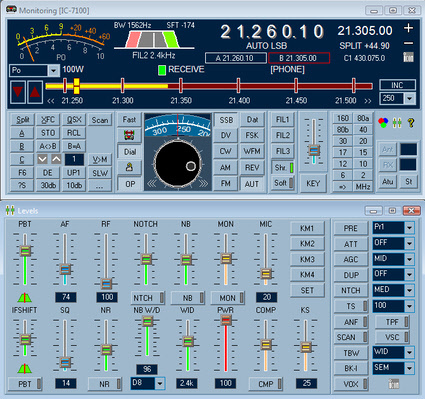 TRX-Manager rig control screen (for IC-7100). Certain features are rig-dependent. TRX-Manager is the ultimate rig control software. It not only provides computer control of all of your transceiver's major functions, but provides additional new features not available in any rig. TRX-Manager also integrates seamlessly with LOGic, allowing you to use all of LOGic's rig interface and logging features simultaneously with TRX-Manager. TRX-manager is one of the rare programs to support almost all the computer control functions of nearly 100 transceivers available on the market in the last 20 years (Yaesu, Kenwood, Icom, TenTec, and Alinco transceivers). Following is an impressive partial list of features. But you really owe it to yourself to check out the demo! memory manager to store shift and CTSS for each channel. Load/save files to disk. synchronization/control of external devices including: rotator, keyer, amplifier, antennas (steppIR), wattmeter, etc. logbook with DXCC summaries, LOTW report., etc. TRX-Pan. Panoramic display of IF Output and Quadrature SDR. A new generation of computer-interfaceable rigs now offers an even wider variety of computer control capabilities. TRX-Manager's extended control features support almost all of these available commands. Since remote control features vary from rig to rig, the best way to find out what your rig can do is to play with the demo. 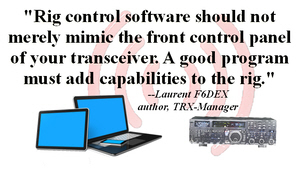 Visit the TRX-Manager site for a more detailed discussion of extended control. Please contact us if you have further questions. The TRX-Manager 5 upgrade is NOT a free update (except for CATEGORY A users). It requires a new installation. If you are a registered user of any previous version of TRX-Manager or FT-Manager, you are eligible for the special upgrade price of $55. Whatever the date of your purchase and the version you are running, you are elligible for free email support as long as TRX-Manager is commercially distributed. ***WARNING! ***Not all USB-RS232 interfaces are alike! For it to work consistently with your rig, make sure your USB interface has the FTDI chip. We carry the W1GEE Products line of inexpensive radio and CW keyer interfaces for Kenwood, Icom, and Yaesu, as well as their newly-released USB level converters for Icom and Yaesu. We also carry stand alone USB-RS232 interfaces and other ham radio-related computer cables. CLICK HERE to see what your rig requires. In case you have not already clicked on one of the previous links, here it is again. DOWNLOAD THE TRX-MANAGER DEMO. To keep everyone happy, please read our Return Policy before purchasing this great product.